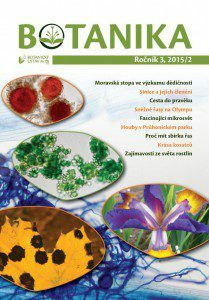 Since 2013 Institute of Botany, The Czech Academy of Sciences publishes the popularization journal Botanika (Botany). Regular issues are only in Czech, special issues about plants in Průhonice park (rhododendrons, conifers) are available also in English. You can purchase them at the cash desk at the main entrance to the Průhonice park. Mgr. MgA. Radim Hédl, Ph.D. The text should be comprehensible to a person who has never dealt with the issue; is intended for educated laypeople with an interest in botany. It should be interesting, readable, not just descriptive. ie 4,000 characters without spaces. If you need to exceed the length, contact the editors. Format and styles. Do not format the text. You can use italics or bold cuts to highlight some words or passages. Do not write whole words in capital letters – not in titles. Send pictures in separate TIFF files, JPG or GIF (if possible, use formats without loss of compression when saving). Enumerate the numbered images with the corresponding numbers. Author’s proofreading and preview. During the editorial process, the author will receive his / her text for proofreading in MS Word (after processing comments and editorial edits).